What's New - Master ASL! Players move through a full color game board advancing when they correctly sign vocabulary words, sentences, and expressions. Challenge cards enable a player to question another player’s sign production. If incorrect, the player loses a turn. 3 to 8 players. A fun way to review vocabulary and practice sentences!. 148 vocabulary cards with vocabulary from ten units. To order, contact Sign Media, Inc. at 800.475.4756. Featuring 22 classroom activities focusing on classifiers, numbers, fingerspelling, storytelling, parameters, math, geography, science and more. Teacher’s manual with activity instructions, handouts, and answer keys. DVD with all student instructions, language and culture content, quizzes, and discussion prompts for each activity. 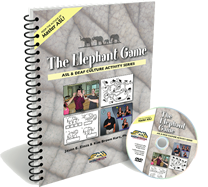 Twenty-two activities that meet foreign language standards with enough content to cover two years or four semesters of ASL instruction. Activities can be used as a review at the end or beginning of a semester. Use the activities for substitute lesson plans. 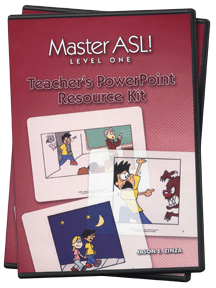 This kit contains 100 of the most popular and effective illustrations from Master ASL! Level One. The slides are intended to be used to elicit student communication on a wide variety of topics, encouraging the students to use his/her imagination and communication skills to describe the scene, characters, events, and actions in as much detail as possible. The illustrations have been carefully selected for multiple use. As students develop broader communication skills, they will be able to add more details to the illustrations. 1. All students can access the material and maintain eye contact with classmates and the instructor without looking down at their book. 2. The illustrations are larger than those found in the book making them easier to understand. 3. The instructor can draw students' attention to specific details within the illustration. 4. New vocabulary can be introduced to students. 5. Communication flows more naturally as students respond to comments, observations, or stories shared by other classmates or the teacher. Windows Minimum Requirements: PC with a 200 MHz or higher processor; Microsoft Windows 98 Second Edition or above; Microsoft PowerPoint; 800 x 600 or higher screen resolution. Mac OS X Minimum Requirements: G3, Mac OS X-compatible processor or higher; Mac OS X version 10.2.8 or later; Microsoft Office 2004 for Mac or compatible software; 1024 x 768 or higher screen resolution. New Video FAQ about Master ASL! and National and State Standards. The workshops page has been updated to include many new workshops by various presenters. For questions or comments, contact Sign Media, Inc. at 800.475.4756.